The Geneva Motor Show 2016 will see Mercedes-AMG will unveiled a car that it’s virtually impossible to resist calling the "junior C63" – the C43 Coupe, on sale very soon from about £47,000. That price isn’t confirmed, but when it is it’ll make the C43 something like £20,000 cheaper than the C63, while being only fractionally less insanely quick. 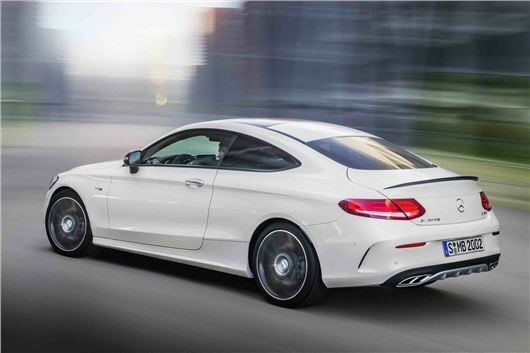 The Mercedes-AMG C43 4Matic Coupe, to use its full name, has a twin-turbo V6 petrol engine with 367PS and 520Nm driving all four wheels through a nine-speed automatic transmission. That’s good for a 4.7-second sprint to 62mph and a limited 155mph top speed. Compare that to the C63, which has a 457PS, 600Nm V8 driven through a seven-speed automatic and good for 0-62mph just 0.3 seconds quicker. In that context the C43 is a bargain, and will also be easier to manage on the road for the majority, because the C63 is rear-wheel drive. That added traction makes the C43 less 'pure', which will be a major sticking point in some circles, but in fact the power distribution in the C43 is rear-biased (69:31) meaning it should behave like a rear-wheel drive car in any event. Indeed, Mercedes-AMG is so confident in the dynamic abilities of the C43 that it has bestowed it full 'AMG' status, rather than making it an 'AMG Performance' level car, that being the name assigned to Mercedes-Benz models with higher power outputs but that don’t quite reach the elusive AMG zenith. The car has three-stage adaptable dampers as standard, as per the C63, and a three-stage electronic stability control system too. That means the character of the coupé is transformable between 'passably comfortable and benign' and 'juddering tail-happy mentalist'. Your choice. Standard kit includes 18-inch AMG alloy wheels, Mercedes pleather (called Artico) for the seats, a flat-bottomed steering wheel, red contrasting stitching for the dash, and all the usual fripperies you’d associate with a top-end Mercedes-Benz, like dual-zone climate control and navigation.